With the best overall odds of any draw-style game it’s easy to love Easy 5. Play for the chance to win a cash jackpot that starts at $50,000 -- or three other prize levels -- every Wednesday & Saturday. Choose five numbers from 1 through 37. You can pick your own numbers or let the Lottery’s computer randomly Quick Pick them. 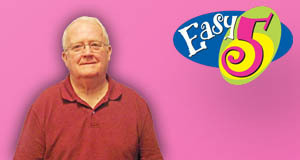 Easy 5 drawings are held every Wednesday and Saturday except for Christmas Day. 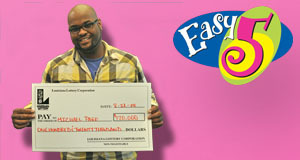 Make sure you buy your tickets for each Easy 5 drawing by 9:30 p.m. on the day of the drawing. Tickets purchased after 9:30 p.m. on drawing nights will be valid for the next drawing(s). 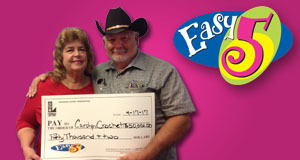 Easy 5 winning numbers are displayed on Official Draw Show stations every Wednesday and Saturday night and updated on this website. 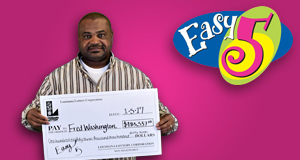 Add ezmatch to your ticket for an extra $1 per drawing for the chance to win up to $250 instantly. 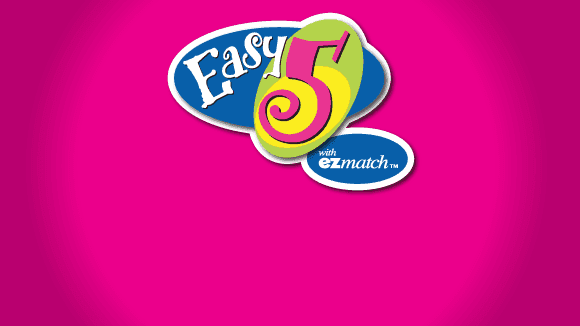 When you purchase ezmatch, five ezmatch numbers will print in a column on your Easy 5 ticket, along with a corresponding instant prize amount for each number. Simply match any or all of your five ezmatch numbers to the Easy 5 numbers on your ticket to win the ezmatch prize shown for each number. You will receive a separate ticket with your Easy 5 and ezmatch numbers for each set of numbers played. Ezmatch applies only once on a multidraw ticket. Claiming an ezmatch Prize. 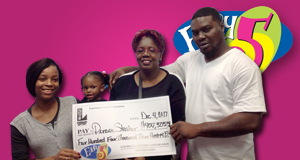 Ezmatch prizes may be claimed immediately at any Lottery retailer. If the Easy 5 drawing has not yet occurred, you will receive an Exchange ticket containing your numbers for the Easy 5 drawing in addition to your ezmatch cash prize. 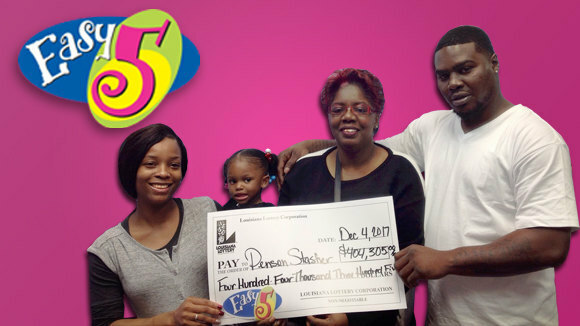 If you choose to wait until after the Easy 5 drawing to claim your ezmatch prize, it will be combined with any Easy 5 winnings from that ticket. 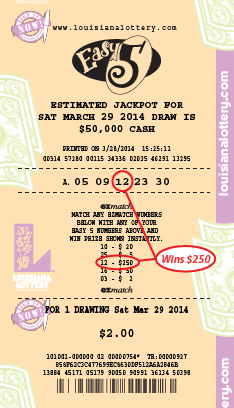 Any combined prize totaling more than $600 on one ticket must be claimed at a Louisiana Lottery regional office. 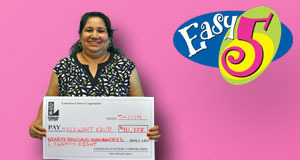 Ezmatch prizes must be claimed within 180 days of the first Easy 5 drawing date on the ticket. Refer to the ezmatch game directive for complete rules. 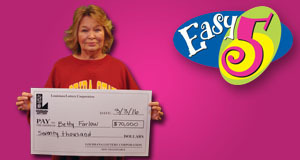 The Easy 5 jackpot starts at a guaranteed $50,000 cash but grows for each drawing based on sales until it is won. Jackpot prizes are pari-mutuel and are divided equally among all jackpot-winning tickets. Playslip. In blue or black ink, fill out a playslip with your numbers and game options. You may play up to five sets of numbers on each playslip. This option is best when you want to choose your own numbers. Be sure to check your playslip carefully. Easy 5 tickets cannot be cancelled. Ask the Retailer. If you want a Quick Pick, tell the clerk. You can play up to 10 Quick Picks on one ticket. Be sure to note whether you want to add ezmatch or multidraw when placing your order. 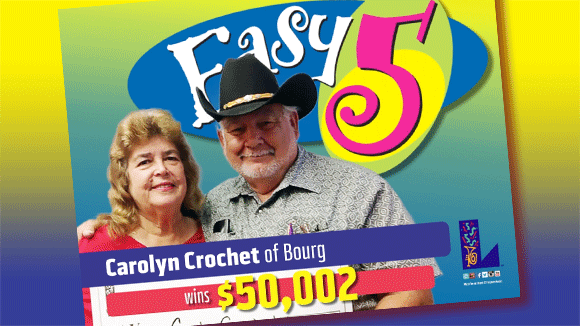 The Easy 5 jackpot prize is a pari-mutuel prize, which is divided equally among all winning tickets and may vary for each drawing. 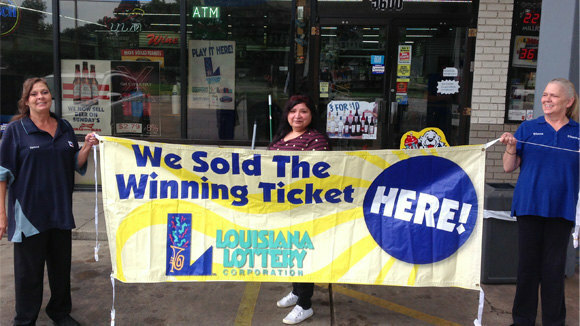 If the jackpot is not won, the prize is carried over and added to the jackpot prize pool of the next drawing. 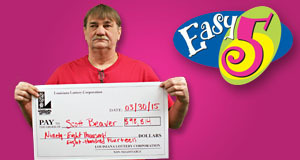 When was Easy 5 relaunched? 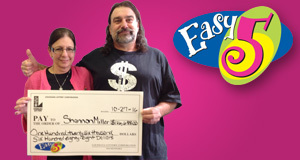 The Lottery relaunched Easy 5, with a starting pari-mutuel cash jackpot of $50,000, September 16, 2007. The first drawing occurred September 19. 239 Hwy 193 I-20 Exit 185 Ste.